Bias time: I was barely prepared to like John Wick at all, and the possibility of loving it seemed so laughably remote that it hadn't even occurred to me. And yet here we are, and I kind of loved John Wick. It's a silly world. On paper, the film is generic as generic gets: John Wick's (Keanu Reeves) wife dies of an unnamed disease (Bridget Moynahan plays the role, such as it is), and her final act on this world is to arrange for a beagle puppy to be sent to him. This is a beautiful, lifesaving act, and it lasts for two days, until a vile, bro-ish Russian named Iosef (Alfie Allen) wants to buy Wick's beautiful muscle car, and Wick isn't selling. So Iosef and his thug buddies break into Wick's home, steal his car, beat him bloody, and in a moment of pique, kill the dog. And it is this, which he later describes as the theft of the last hope he had in the whole world, that pushes him into a blood rage. John Wick, you see, is a retired assassin. And Iosef is the son of Viggo Tarasov (Michael Nyqvist), the Russian mobster who used to be Wick's employer. And that is all the ingredients we need for a film long revenge quest & war against the Russian mafia. The beauty of John Wick - and I don't use "beauty" in some rhetorical sense, but in the sense that John Wick is, in fact, an absolutely breathtakingly beautiful movies in places - is that it is, in every possible way, essentialist. What do we need to know? That John's wife died and he he loved her, and his beagle died, and he loved her too. We need nothing else, and the filmmakers (writer Derek Kolstad; directing team Chad Stahelski & David Leitch, the latter uncredited for contractual reasons) do not provide it. The Wick marriage is depicted in a montage whose clarity and efficiency rival the one in Up for communicating the whole span of a relationship in wordless, tragic imagery, and the visual shorthand and elliptical editing throughout the opening 10 minutes usher us all the way into the film's second act so quickly and with such limited energy spent on anything that isn't directly related to the most stripped-down version of the scenario that the film resembles an impressionistic ballet more than an action movie. An action movie it is, though; the best American action movie in a few years, I almost want to say, except that there are certain expectations about both "action movie" and "American" that the multinational production doesn't entirely satisfy. That it is a well-choreographed series of fight scenes with crackling editing (by Elísabet Ronaldsdóttir) is not all that surprising: Stahelski and Leitch are both veteran stuntmen, and they presumably know a thing or two about the ways that human bodies can be battered and thrown around onscreen, and the ways to move a camera to capture that from its most interesting angles. But John Wick isn't really an action film that works as a combination of "wow, that was amazing!" moments in the fashion of The Raid 2, the only 2014 action movie that belongs in the same conversation. * Which is especially odd, given that it consists of very little outside of "that was amazing!" moments. 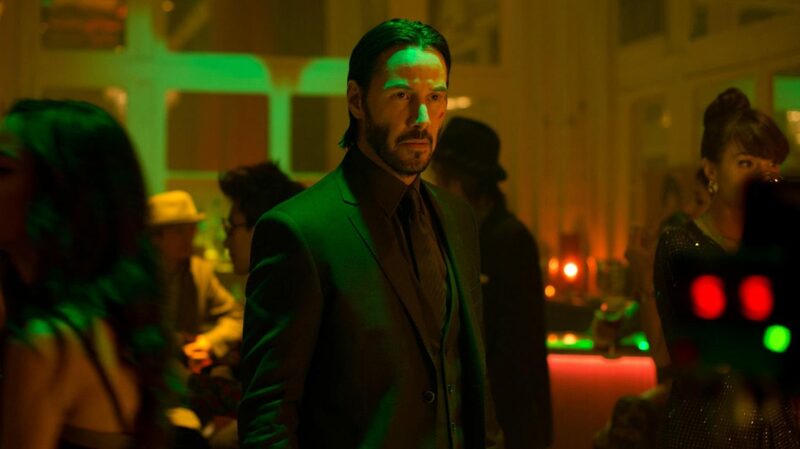 What's marvelous about John Wick is that it filters it amazingness through chilly storytelling and aesthetics, working something as a psychological portrait of its title character that is rather knocked off track in the first moments by discovering that, well, he actually doesn't have any psychological depth, and instead of regrouping, digs in deeper to become the cinematic expression of a man who has replaced every element of his personality with a brutal desire for revenge. Hence the film's breathtaking efficiency, and its refusal to indulge in any sort of detail or world-building that isn't directly related to the story at hand. There are many, many places where John Wick could go off on that kind of tangent: the world in which it takes place has a robust subculture of assassins, using their own currency and operating according to a code of behavior that suggests great depths and complexities, and the film is populated by a host of terrific character actors who, one would expect, are all going to get their big showcase moment: Willem Dafoe, Lance Reddick, John Leguizamo, Ian McShane. And they're not. The film isn't just withholding, it's being conspicuous about it, presenting a full, living, colorful world and yoking itself to a man barreling through it with single-minded fury. It doesn't sound like it, but I take this to be an absolutely great thing. The coldness and cleanness of John Wick is its most unique and easily its best feature, even above the drop-dead gorgeous way all of this is shot by cinematographer Jonathan Sela, with frequent recourse to florid, artificial coloring, and a film-long fascination with the way that physical texture, shadow, and color interact with each other and with moving objects (people, mostly, but not exclusively). Between the film's tone, its narrative sparsity, and its visual style, it feels something like Only God Forgives as directed by Jean-Pierre Melville, or Michael Mann's Point Blank. Lord knows where any of this comes from: Sela has never shot anything like this at all, and it's become increasingly rare for first-time American directors to go this far overboard on style and elusive narrative structure. But I'm glad it did: John Wick is pretty terrific, with an action scene in a bathhouse that I would stack against anything else from English-language cinema in the last decade for its visual elegance, the skillful and appropriate employment of brutal violence, and the energy and complexity of the fighting itself. The other setpieces aren't quite so good (and the first, the second time that Wick's home is invaded, left me feeling rather dubious about the whole film, I will confess, though this turned around quickly), but it is, after all, not a film about setpieces: it is a film about hopelessness expressing itself through violence (and being redeemed, in a final scene that really ought to have pissed me off, but which just barely manages to work by employing just about the only specific chain of details I can imagine working in that moment), a film about implacable anger beautifully channeled through Reeves in the role that best employs his non-presence since The Matrix 15 years ago. It has poetry in its soul: formally elegant and cold poetry, but poetry nonetheless. And it left me feeling more exhilarated and pleased than a bare-bones revenge movie has in a whole hell of a lot of years. *Before anyone brings it up in comments: yes, I adored Snowpiercer, and I'm not considering it an action movie for my present purposes.